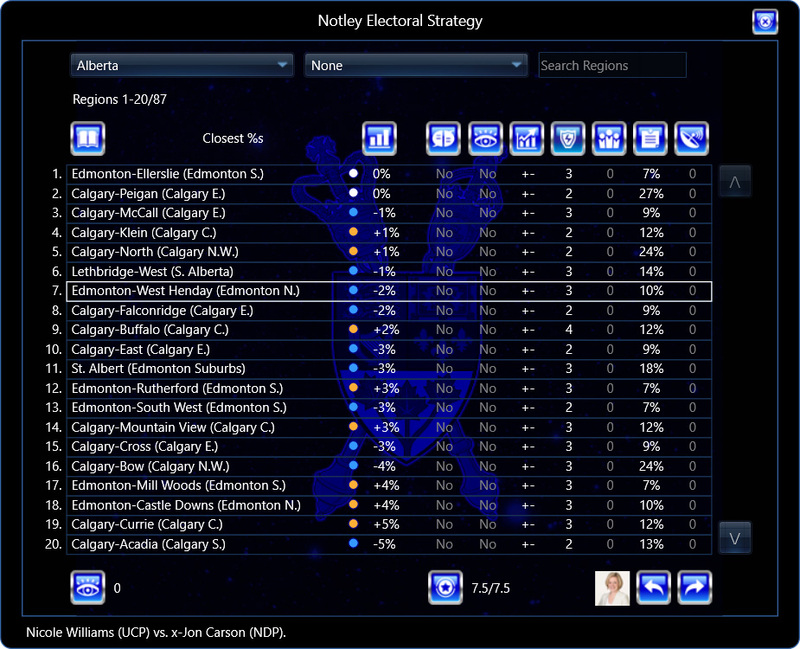 Get the definitive Alberta election game for 2019 and beyond! 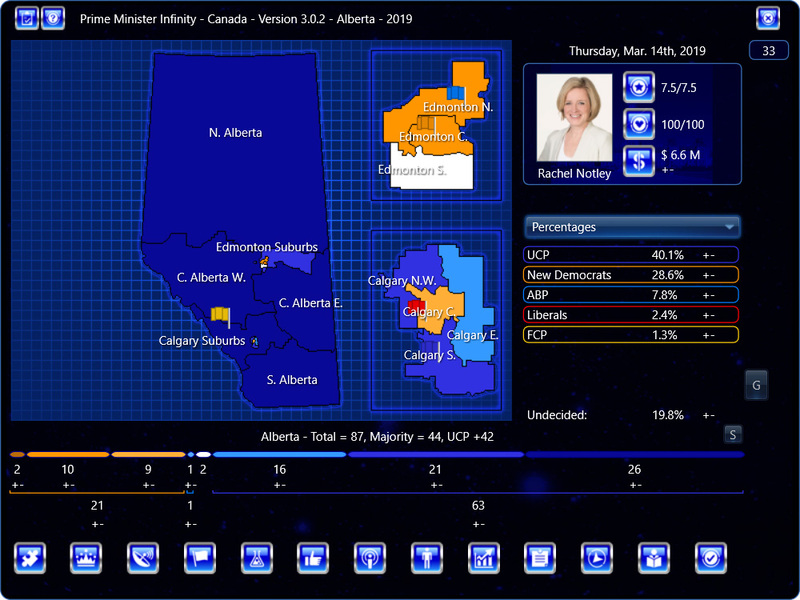 Note: Alberta 2019 is included as part of Prime Minister Infinity – Canada (for Windows and Mac). 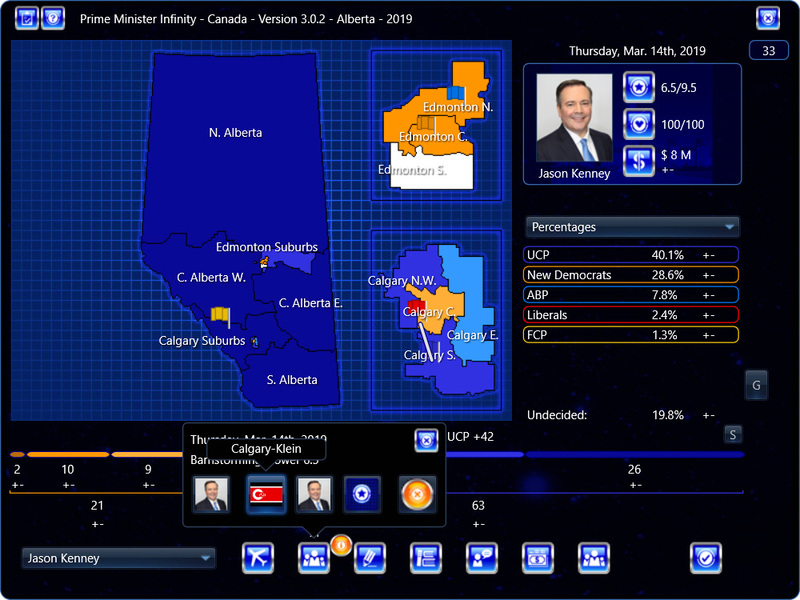 You can order Prime Minister Infinity – Canada, which includes Alberta 2019 (for Windows and Mac), and receive the latest release version immediately. The game is available for $19.95 CND. Prime Minister Infinity – Canada will run on Windows (7, 8, 8.1, 10, including the Surface 3) and Mac (macOS 10.10 and up). 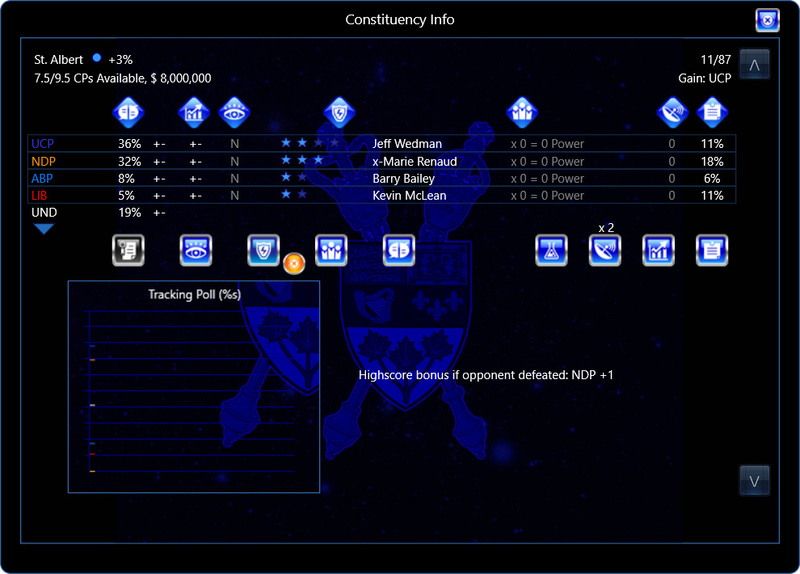 Battle for control of the provincial Legislature. Can the NDP return to power with a majority, or will the United Conservatives take the Premier’s office? How many breakthroughs can the Alberta Party make? 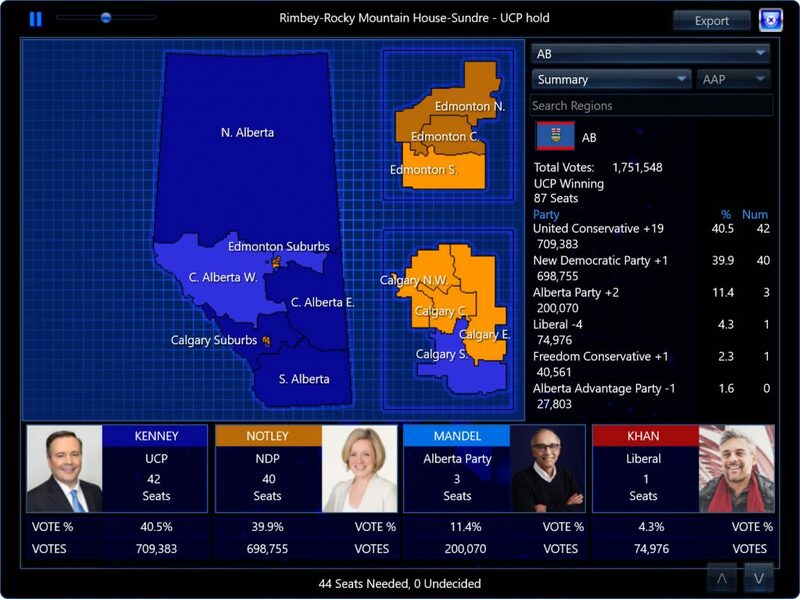 Alberta 2019 includes all 87 electoral districts, 8 parties (NDP, UCP, Alberta Party, Liberal, Green, Freedom, AAP, and AIP), local candidates, leader and campaign attributes, platforms, and much more. 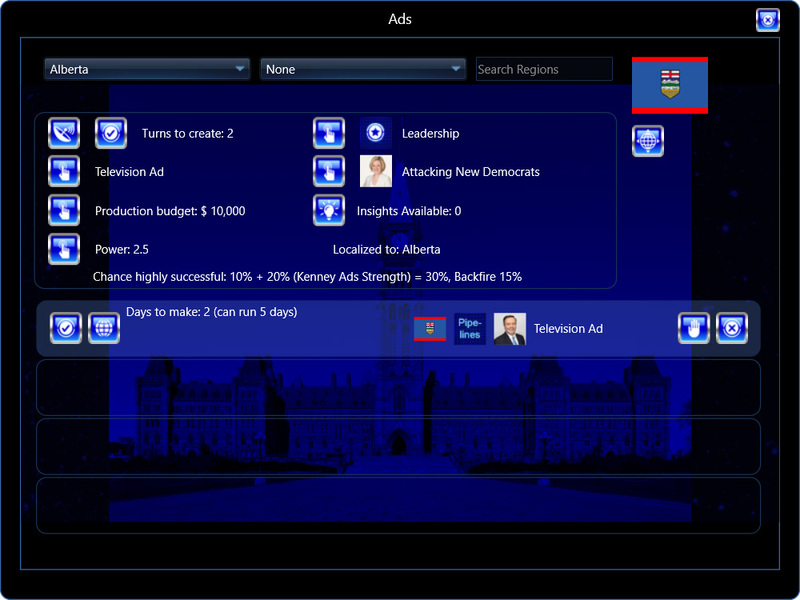 Craft ads provincially or down to the specific seat, gaining regional bonuses and lifting up your candidate or dragging down your opponent with attack ads. Send resources to buttress campaigns at the seat level, or decide when it’s time to pull the plug and focus somewhere else. Direct your leader or provincial-level campaigners, telling them where to go and what to do. Should they help a marginal-seat candidate, head to one of the news networks and spin, get ready for a televised debate, or something else? Hone your provincial strategy, targeting seats to increase your effectiveness and wisely allocating limited resources in money, command-and-control, and political influence on a race-by-race basis. Leaders have not only personal attributes (Leadership, Experience, Integrity, Issue Familiarity, and so on) but campaign attributes, which affect their campaign’s ability to respond to news stories, research electoral insights, gain a polling advantage, and more. Expose scandals on the provincial party operations, or dig up scandals on specific candidates and then fan the flames until the story bursts forth on the provincial scene. 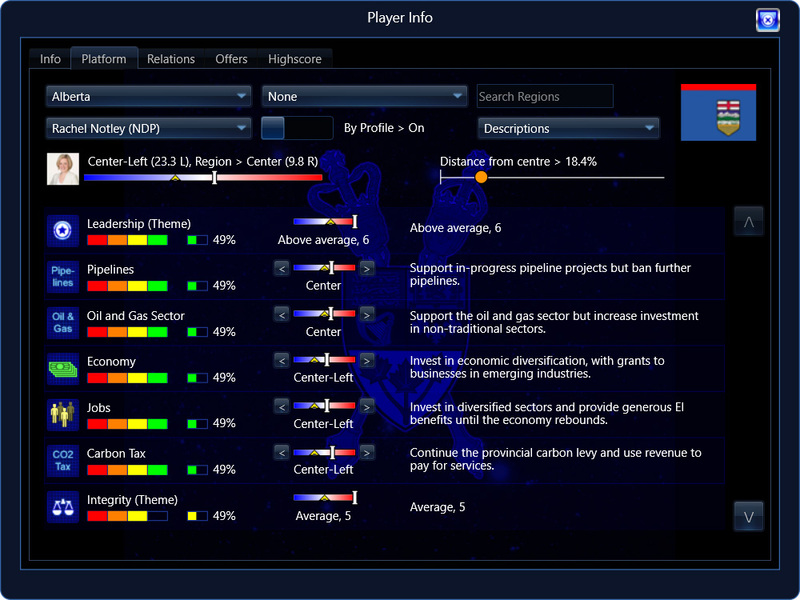 Tailor your platform for targeted regions, keeping an eye on issue profiles and regional centres. Watch election night as results are announced, and export the detailed results for review or sharing. 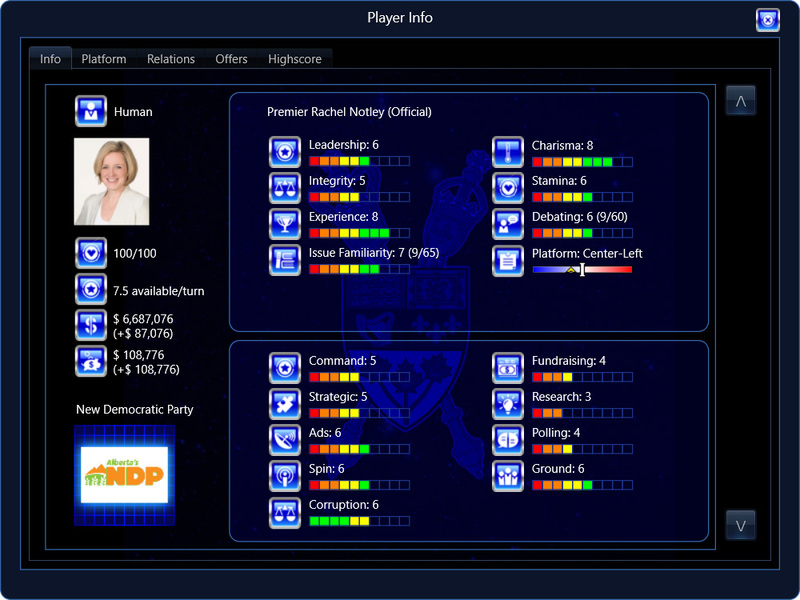 Prime Minister Infinity – Canada, which includes Alberta 2019 (for Windows and Mac), contains a Campaign Editor, giving you the ability to modify campaigns, or create your own, including editing, adding, or removing constituencies, issues, leaders, parties, endorsers, campaigners, and more. For Windows (7, 8, 8.1, 10, including the Surface 3) and Mac (macOS 10.10 and above).